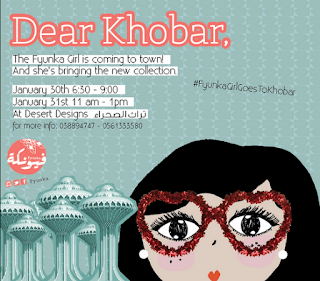 So today, my friend ALAA and I went to the launch of fyunka's new collection event at desert design. It was well organised event! My favorite bag from her new collection is oud bag. And also i got the OUD NOTEBOOK. Dear Khobar girls if you missed today event DON'T WORRY! Fyunka will be there tomorrow at the same place desert design january 31, from 11 am to 1 pm go and shop your favorite fyunka.